The San Antonio Conservation Society proudly presents, "A Night in Old San Antonio: A History in Photographs," featuring images from the University of Texas at San Antonio Libraries Special Collections and from the San Antonio Conservation Society Foundation Library. Learn more about how this popular Fiesta event grew from a one-day Indian Harvest Festival held at Mission San Jose into one of the nation's largest historic preservation festivals, lasting four nights. This exhibit provides a behind-the-scenes glimpse at the colorful characters and unique traditions that make NIOSA one of San Antonio's favorite annual parties. It also illustrates how proceeds from NIOSA are used to help protect and restore historic properties around the city of San Antonio. To experience NIOSA, and find out the dates for this years festivities, visit niosa.org. The San Antonio Conservation Society Foundation Library is located at 107 King William St. Hours are Monday - Thursday, 9:30 a.m. to 3:30 p.m., and Friday by appointment. 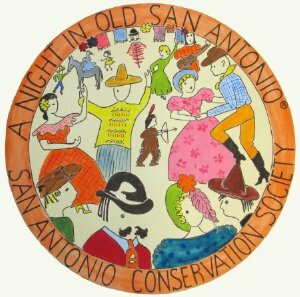 NIOSA® and "A Night in Old San Antonio"® in indica, symbols and designs are trademarks of the San Antonio Conservation Society and all rights reserved. 2012 San Antonio Conservation Society. All photos in this exhibit are copyrighted and may not be copied or reproduced without permission.